Plinky | Because sometimes you need a push. On September 1st, 2014, Plinky.com will go into archive mode: that means that users will no longer be able to log in to respond to Plinky prompts. Be sure to export your responses before September 1st, 2014. 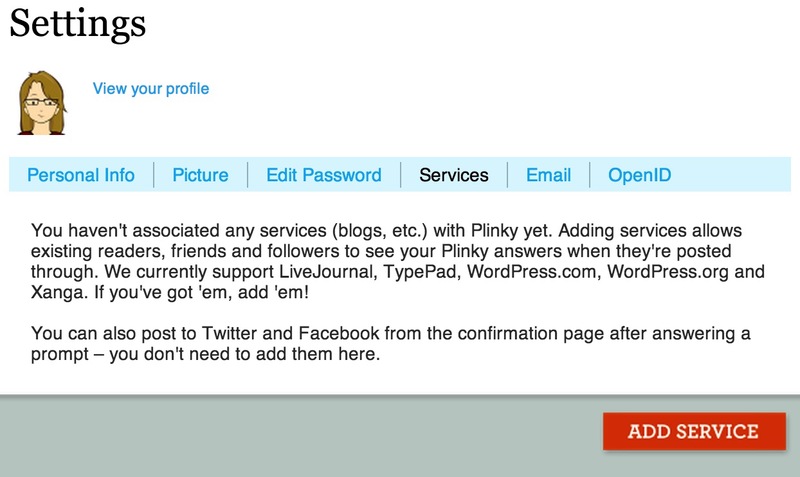 After September 1st, 2014, you will no longer be able to log in to Plinky.com. Here’s how to export your responses in either HTML or plain text formats. On the following screen, you can choose whether to download a file containing your responses, in plain text or HTML format. (You can download both formats, if you like.) When you click on either plain text or HTML, you will be prompted to save the export file to your computer. If you have any trouble, contact us in Support. Looking for writing tips and inspiration? Join us over at The Daily Post , where we share a writing prompt each day as well as writing and photo challenges to gently nudge your creative muse. Writers are the great close observers of everything that happens in our world. The quality of the light filtering through the window in winter; the glint of the moon on snow; the sound the wind makes in empty branches; the adhesive sound of tires on wet pavement. All these observations are small images that can become pieces of a story. These “glimmers of a beginning” surround us in our daily life, but how can we keep track of them? It’s time to get out your trusty digital or good old-fashioned notebook. These days, most people don’t go very far without a smartphone. If you’ve got a smartphone, we highly recommend Simperium’s Simplenote, an awesome little clutter-free app for Mac, iOS, Android, and Kindle designed to take notes wherever you are. If you’ve been successful resisting the smartphone crowd up until this point, carry a small notebook and pen around with you. Take time out of your day to try and observe your surroundings and make a point of documenting three “glimmers of a beginning,” from different points in your day. By making a habit of close observation, you’ll soon have a collection of story starters at your disposal that you can mine when inspiration has run off to Saskatchewan with your muse, allowing you to keep writer’s block at bay. 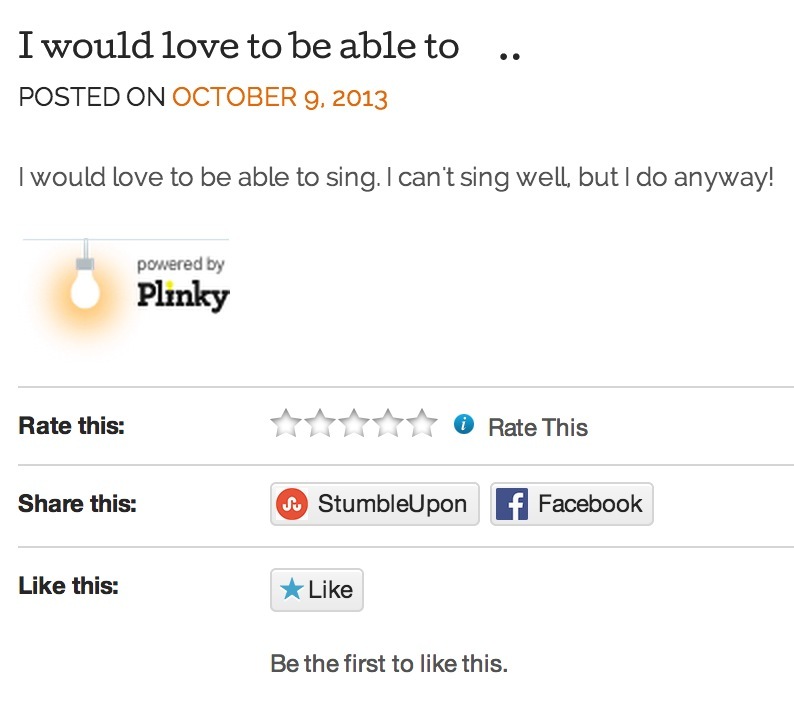 Did you know that you can share your Plinky prompt responses to your WordPress.com blog? It’s a snap to set up and today, I’ll show you how. 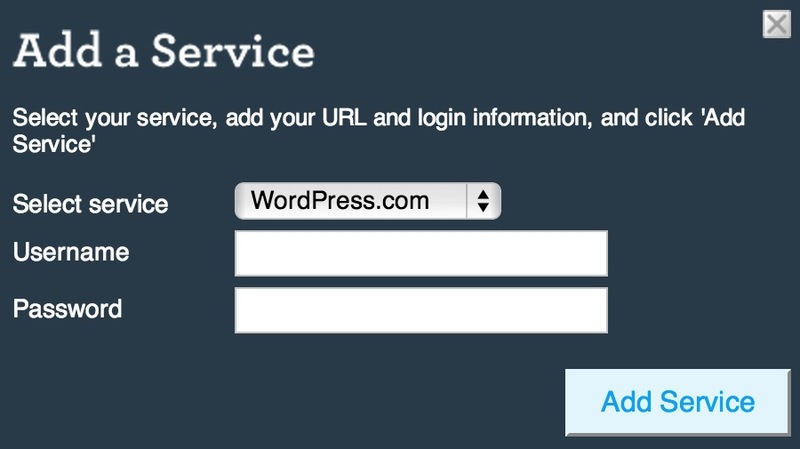 Now, you can head on over to your blog and see your Plinky prompt response on your WordPress.com site! Pretty nifty, eh? Meet Faith Cook. She recently completed a novel for National Novel Writing Month (NaNoWriMo) that grew out of a Plinky Writing Prompt. Tell us the story of how you became a writer. I think I’ve always been a writer. I’ve loved making up stories ever since I was old enough to dictate them for my mom to write down! As a child, I didn’t write as much as I do now, but I was always making up stories to act out with my friends. It wasn’t really until middle school that I realized, “Hey, why don’t I start writing these ideas down?” I started out writing short stories and drabbles mostly, but then I wrote what I thought was my greatest work at the time. I’d called it The Silver Heart, and it was about a journey a girl took to find a magical necklace. I thought it was so great, but I’ve since hidden it away in a drawer in shame, too embarrassed to do anything with it. I like to think I’ve gotten better at writing since then, though. How did you use Plinky in your writing? Well, first off, I’ve always liked the prompts on Plinky. I stumbled upon the site over a year ago, in the midst of a horrible case of writer’s block. The prompts helped me start thinking creatively again, and I’ve gotten several ideas from the site over time, including the one for my current novel. I had decided to do NaNoWriMo (National Novel Writing Month) this year, but I didn’t have a single idea. 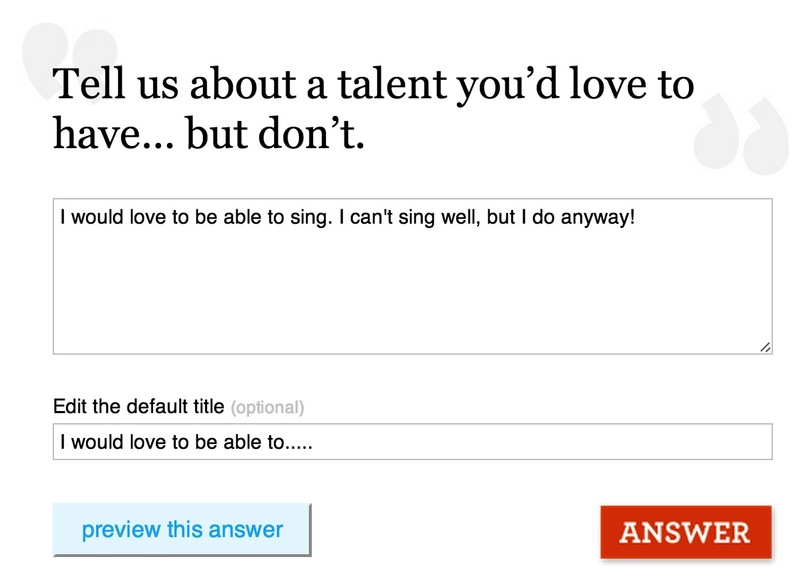 I was freaking out, so I got on Plinky and started answering prompts at random. It was the one for October 29th, 2012 that got me thinking. The prompt said to google a word, and write about the 11th picture you found. I randomly googled the word “rain” and started looking at images. I wrote a bit about a girl running in the rain, and my idea was born. Tell us a bit about the novel you’ve just completed. Get over your writer’s block and get writing. Sign up for Plinky.com today and get inspiration delivered daily. Sometimes the thought of starting a writing project can feel overwhelming: excuses can flood your creative brain: It’s too big a project — I’ll never get it done. I don’t have it in me! Soon enough, your mind drifts away to shinier things, such as what’s for supper, what’s on t.v. right now, or, I wonder what the score was in last night’s big game? By this time, you’ve wandered away from the computer, or your pen and paper, distracted from your writing project. Regular Plinky.com users know that Plinky is an awesome source of daily creative writing prompts to help you develop your daily writing habit. Need a way to kick off your next writing project so that you can apply Cory’s advice to your yet-to-be-written best-selling novel? Sign up with Plinky.com and get inspiration delivered to your email inbox, every day.